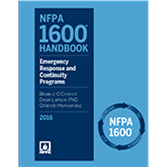 Consult the new NFPA 1600® Handbook, Emergency Management and Continuity Programs for requirements and commentary that help you develop and implement your program. Equipped with the first edition NFPA 1600 Handbook, business continuity and emergency management officials responsible for disaster prevention, mitigation, preparedness, response, continuity, and recovery can tap into a valuable source of expert commentary related to NFPA 1600, Standard on Disaster/Emergency Management and Business Continuity/Continuity of Operations Programs. A vital tool for the development, implementation, assessment, and maintenance of disaster/emergency management and continuity of operations programs, this new Handbook offers guidance, clarifies requirements, and provides valuable insights that help you prepare for specific hazards and help ensure your company or organization achieves compliance. Includes complete 2016 NFPA 1600 text, featuring new sections on Continuity and Recovery in Chapter 6: Implementation, a new self-assessment tool in Annex B, detailed information on family preparedness in Annex I, and other important changes in the standard. Has a helpful list of acronyms that are commonly used in the industry and a technical/substantive changes table showing the changes to the standard from the 2013 edition to the 2016 edition. Provides commentary written by experts with an in-depth knowledge of NFPA 1600. Offers guidance on training, education, exercises, and tests. Follows the Plan, Do, Check, Act (PDCA) model with shaded tabs to help follow along with the PDCA cycle. Is also available in PDF for instant searches and interactive PDF functionality. The National Commission on Terrorist Attacks Upon the United States (the 9/11 Commission) recognized NFPA 1600 as our National Preparedness Standard. The 2013, 2007 and 2010 editions of NFPA 1600 have been designated by DHS, to be used by accredited 3rd parties, to evaluate and certify compliance of entities under its Private Sector Preparedness (PS Prep) Program.